May I be forgiven some shameless self-advertising? My latest book has just been published by Reading’s wonderful Two Rivers Press! 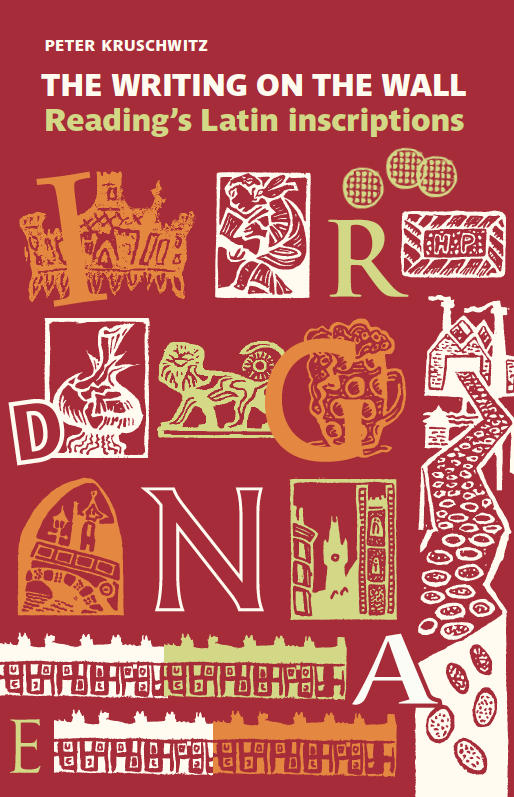 The book contains an anthology of 48 Latin inscriptions that are on display in Berkshire’s county town of Reading (as well as an extra four that have disappeared some time ago!) – covering some 1,800 years of Latin in use as a language of authority, of the church, of business, of learning, and – of course – as a language to honour the dead. The book, showcasing the very finest examples of a body of some 200 inscribed Latin texts altogether from the Reading area, is the result of several years of fieldwork (about which I have occasionally blogged on here) – and if you wish to follow my walking routes, there is even a handy map that shows you the location of the various pieces that are covered in my book on Google Maps! The book, beautifully designed and illustrated, is available from the publisher, Inpress Books, Waterstones, and – soon – Amazon. For anyone in and around Reading: I will be signing copies of my book at Reading’s Broad Street branch of Waterstones next Saturday (12 September, 3-4pm) as part of Reading’s activities during the 2015 Heritage Open Days (further information can be found here). This entry was posted in Carmina Epigraphica, Education, Epigraphy, History of Reading, Poetry, Prose and tagged Death, Education, Graffiti, History of Reading, Latin Inscriptions, Local history, Public History, Reading, Reading Abbey, Reading Museum, University of Reading. Bookmark the permalink. Fantastic book – I love the layout and the inclusion of images of some of the inscriptions. With respect to the Wynford Arms, I have a theory about the motto. The Wynford was Reading’s first full-time gay pub, so to my mind ‘videre non est credere’ could well refer to drag acts/trans people who would likely frequent such a venue. To stretch it a bit further, it might also refer to the structure of the building, which is rather traditional, unlike the social group associated with the venue. This all hinges of course on the provenance of the pub sign itself – was it procured during the pub’s gay era, or does it predate it? It is rather odd that neither the motto nor the coat of arms relate to the Wynford name, but then, what is the provenance of the name itself! I’m glad you like the book – Two Rivers Press have done an amazing job to make it look so utterly appealing, I think! Unfortunately, I drew a complete blank in my attempts to establish the sign’s origin or references. The pub, now closed for good, was in the middle of an ongoing legal battle, so I guess they didn’t have much time to respond to my silly queries – and not sure whom to ask now. There are a number of similar cases, for example a coat of arms on display in West Street by the Palmer Hall building (next to Primark). It says Ianua Securitatis (‘gate(way) to safety/security’). The motto is otherwise unattested. My best guess at the moment is that it’s part of the Reading Amethyst/Abstinence movement, that used to be based in this place. Astonishing, how quickly collective memory can fade, even within a few decades – and we’re still relatively lucky, as so many public records are now available online. Hope your own local history/photo documentary efforts go well! Thanks for the information about the other ‘stray’ inscription – I will have to check it out next time I am in Reading. I’ve spotted a few similar instances in my own local endeavours – it highlights just how important context is in interpretation, and how little attention people pay to what is above/below the eyeline! I’ll see what I can do – I have a few friends who were regulars there (and I’ve been a number of times myself: it was a very welcoming, pleasant place indeed). Last time I walked past, there was a sign out there that the pub is up for new ownership, so I guess it’ll be back in business as a new public house sometime soon: I just hope that it will again be a place with some atmosphere as opposed to a bland chain outlet, of which Reading has already plenty. Difficult location, of course, not only because of the hideous mostly disused tower next to it, but also because of the popular Spoon next door and the Warwick Arms opposite – but if one plays it right, I’m sure something really rather successful (if a bit niche) could be done with it.